Most of the Food Fight reviews we do involve — as one might imagine — food. But, today we’re mixing things up. Quite literally! It’s RevaBlend vs. BlenderBottle Radian. Who blends better? Which is more convenient? What product do we recommend for your gym bag, car and carry-on? Read on, protein-powder and nutrition-shake-on-the-go junkies. This one is for you! What it is: Basically, a blender that you can take with you everywhere and requires no power but your muscles. It has these stainless steel blades at the bottom that is connected to a spinning rubber base, which you roll on a flat surface, giving you up to 3,000 revolutions per minute. Pros: The RevaBlend ($24.99) can blend pretty much any soft fruit or non-frozen veggies along with liquid, giving you endless possibilities of fruit smoothies, ice cream shakes, omelets, salad dressings, salsas, meat marinades and more, all without any power. It’s easy to use, made of BPA-free polypropylene plastic and comes in fun colors like black, blue, lime green, orange, red and purple. It also has a flip-top lid, so drinking or pouring from it is pretty easy. 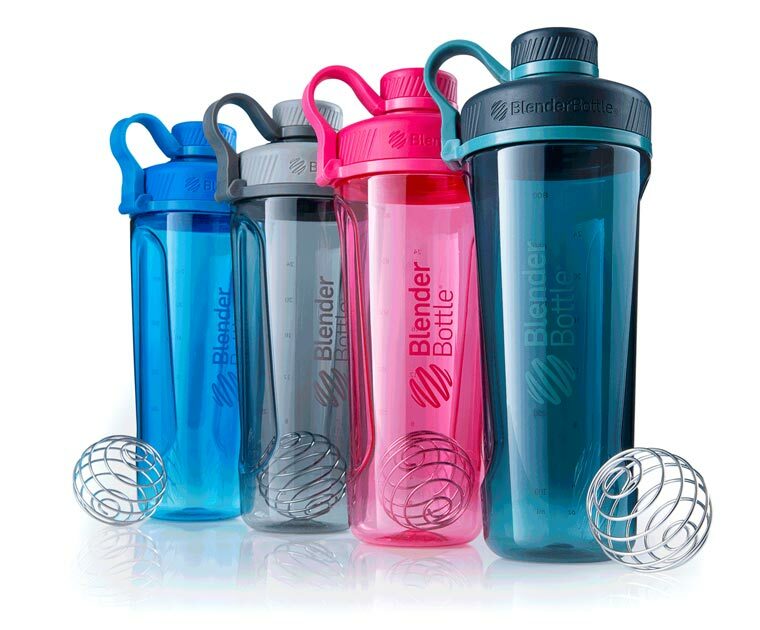 What it is: This is basically a really pretty and sleek version of the BlenderBottle. With a few shakes, that little stainless steel ball will mix your protein powder up like a boss. Pros: Besides being pretty and coming in the fun colors you see above, the BlenderBottle Radian ($16.99) is made from BPA- and phthalate-free materials and — one of our favorite things about it — is that it has a wide mouth opening that fits oversized scoops of protein powder (and the base still fits in your standard-sized cup holder). It’s also backed with a “Leak Proof Guarantee” from the company and is top-rack dishwasher safe. For a little bit more mooloah, you can also get Radian in stainless steel or glass. The plastic version we tried was lightweight, easy to clean and kind of amazing. Cons: You’re not going to be able to do much more than mix protein powder with liquid in this or just drink plain water (you probably could mix an omelet up or a salad dressing, but I’m afraid it would be hard to get the residual taste/color out of the basic plastic bottle), but for that task, it PERFECTS IT. Only other complaint is that, even when it’s clean, if you let it air dry, the plastic tends to look spotty. Obviously you can fix this by drying it off with a towel. Not a huge deal for us, but it might drive clean freaks a bit nuts. Fit Bottomed Line: The Winner! It’s hard to go against the BlenderBottle. 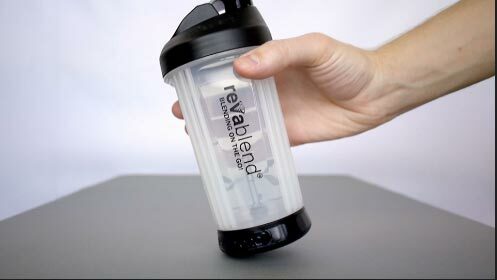 The RevaBlend is certainly awesome in its own right and a great tool that goes beyond mixing just liquid and protein powder (it would be awesome for camping and travel), but for our everyday needs, the BlenderBottle takes this one!